© Sheila Hicks. Courtesy Festival d’Automne à Paris & galerie frank elbaz. Photo Vincent Pontet. 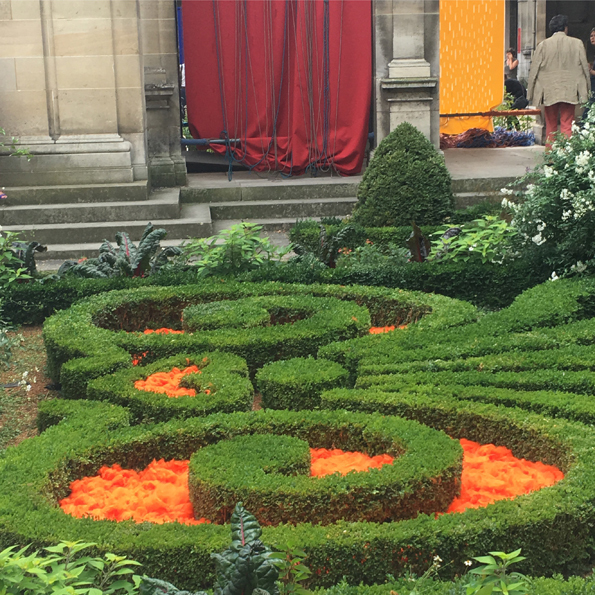 In situ installations successively exhibited at the Musée Carnavalet - Histoire de Paris (September 13 - October 2), in Parisian shop windows (from October 14 on) and at the Atelier décor of Nanterre-Amandiers (December 9 - 17 ) as part of the Festival d'Automne à Paris 2016. Paris, September 13 – December 17, 2016. In situ installations, mixed techniques, textiles. Curator of the exhibitions: Clément Dirié. Co-curator for the Musée Carnavalet - Histoire de Paris: Valérie Guillaume. Production Festival d'Automne à Paris. 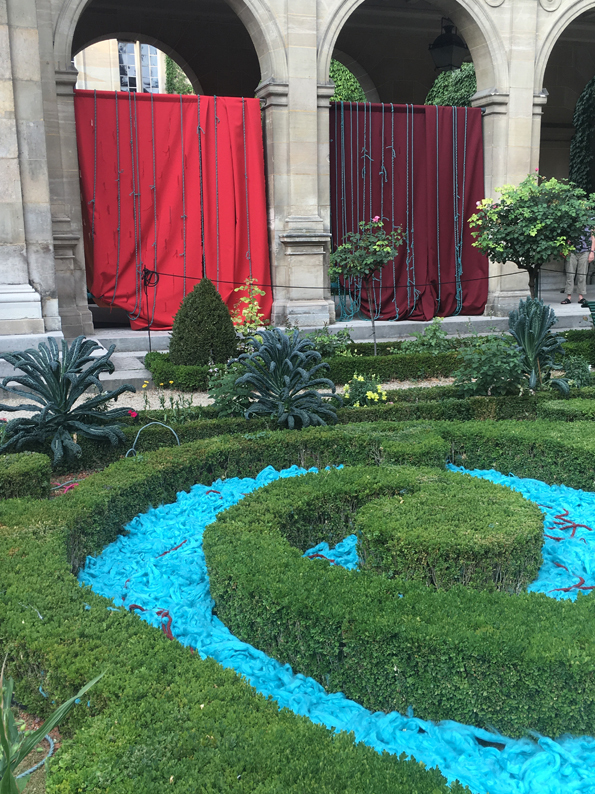 In collaboration with Paris Musées, the Musée Carnavalet - Histoire de Paris for its 150th anniversary and the Centre Dramatique National de Nanterre-Amandiers. With the support of Sunbrella. In collaboration with galerie frank elbaz. © Sheila Hicks. Courtesy Festival d’Automne à Paris & galerie frank elbaz. 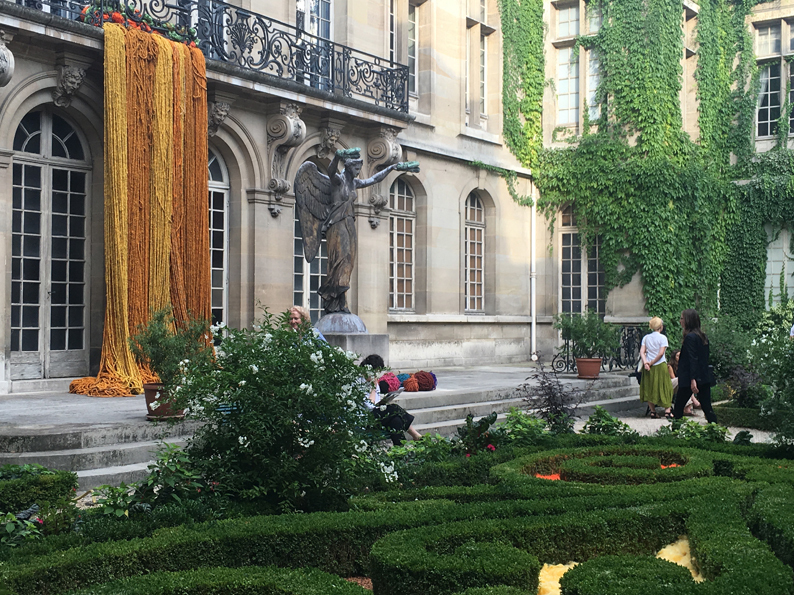 Designed by Sheila Hicks specifically for the Festival d'Automne à Paris, Apprentissages is a three-time path with successive appearences, in places intimately linked to the Parisian geography. 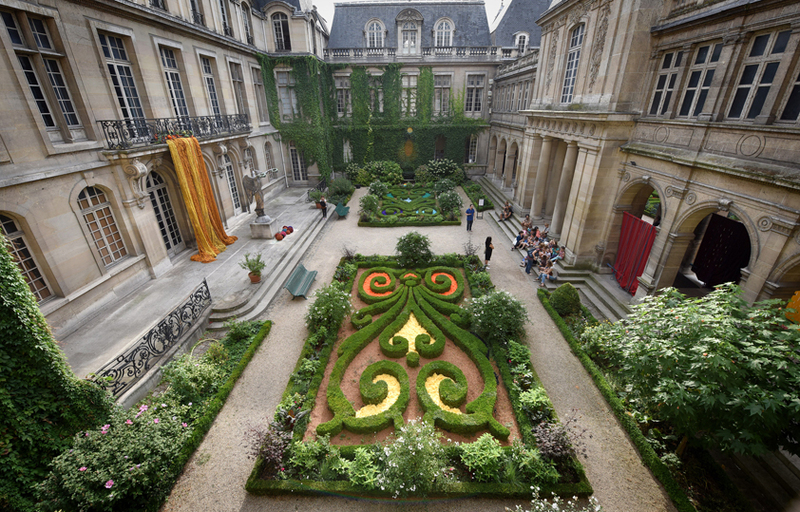 In the Musée Carnavalet – Histoire de Paris (September 13 – October 2), the American artist’s works invest the gardens and the outside spaces of the site and its architecture, horizontally and vertically, from the vegetal "embroideries" à la française, to the arcades of the Gallery, passing through the well-named « Cour des Marchands-Drapiers » and the « Cour de la Victoire ». 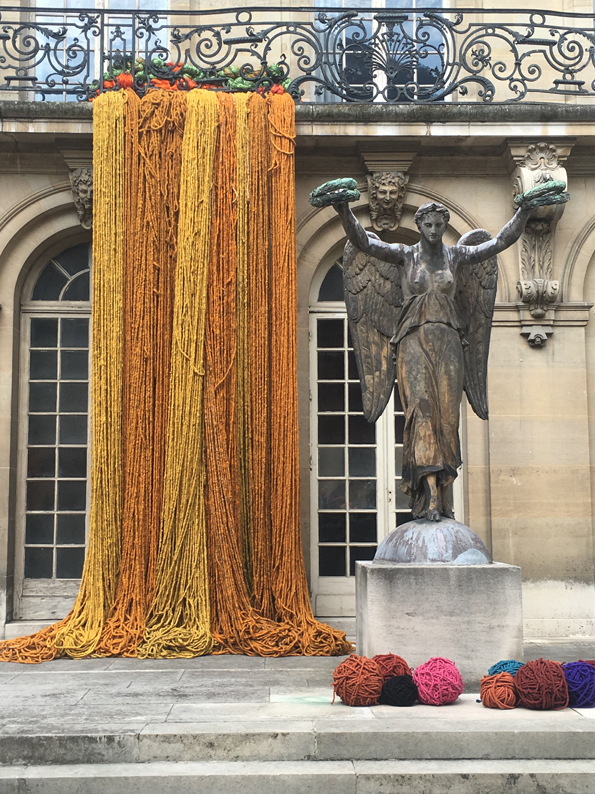 In various Parisian shop windows* (from October 14 on), Sheila Hicks, who admits relaxing herself with window shopping in Paris, intervenes at a lower scale. 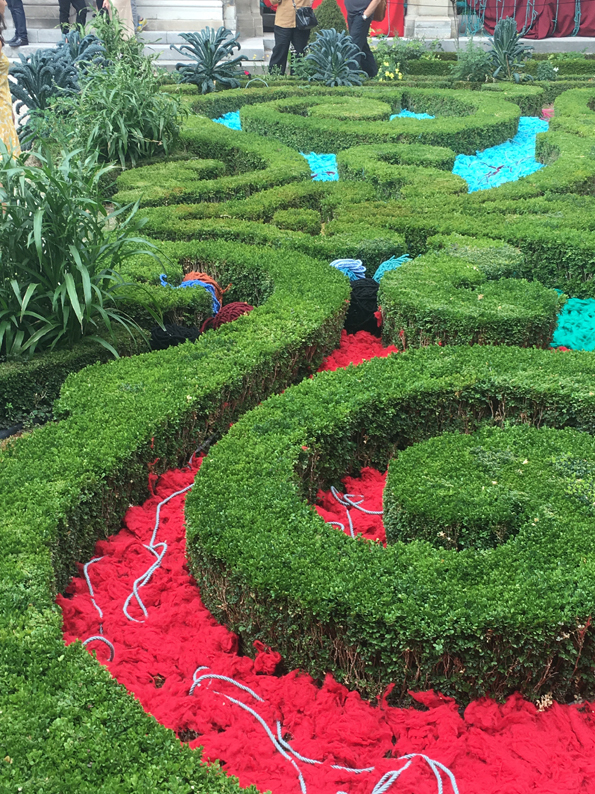 She mixes her universe to the city daily life through some installations, inhabited with her chromatic, textile and pictorial vocabulary, which surprises the passers-by by colourful bubbles and materials along their walk. The finale of Apprentissages takes place in the workshop scenery of the Centre Dramatique National de Nanterre-Amandiers (December 9 - 17), especially opened to the public for this occasion. There, the production space inspires the artist by its dimensions and its plain stage. The installation is more mobile, evolving and takes the audience into account. As suggested by its title, Apprentissages evokes the main raw material of Sheila Hicks’ works and shapes its tactile and sensible language. It also emphasizes the notion of transmission, crucial for the artist, with creations conceived as an open initiation, a flow to favour exchange. More than ever, the textile appears here as an « incomparable mean to build the dialog with each other ». The artist also pays a tribute to her adoptive city of Paris, where she has been working and living since 1964. Sheila Hicks was born in 1934 in Hastings, Nebraska. She lives and works in Paris. *- Maison Bonnet Lunetier, Passage des Deux Pavillons, 75001 Paris. - Librairie Petite Egypte, 35 rue des Petits Carreaux, 75002 Paris. - Régie immobilière de la Ville de Paris, 7-9 rue Saint-Paul, 75004 Paris. - Galerie kreo, 31 rue Dauphine, 75006 Paris. - C.S.E/Docteur Philippe Benillouche, 17 rue Beaurepaire, 75010 Paris.